Reading the NLT Study Bible feels like being guided through Scripture by a compassionate Bible teacher. 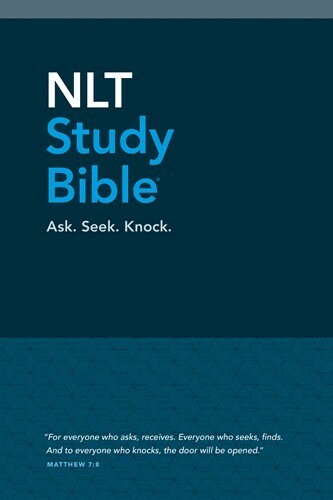 The NLT Study Bible is broadly and favorably regarded for its accessible and clear translation. It is based on the New Living Translation, which translates whole thoughts instead of words into conversational English—thus making it as forceful for contemporary readers as it was for the first readers. Yet it includes the scholarship of a cross-denominational gathering of biblical authorities: every note and supplement is designed with you, the reader, in mind—to help you experience God’s message clearly, faithfully, and with transformational power. While other study Bibles emphasize explaining complex meanings of the text, the NLT Study Bible comes in clear, lively language that allows you to consider other issues, such as historical/cultural background and theological implications. Culturally murky terms are translated with immediate understanding in mind. All of this adds a compelling layer of knowing to a text that is already completely, powerfully alive. The NLT Study Bible for Olive Tree's Bible App includes the NLT Bible text, features, notes, images, and supplemental materials of the print version*. Olive Tree's Bible App lets you read and study with the resources of the NLT Study Bible wherever you go! Over 25,000 Study Notes — nearly one note for every verse of the Bible. Over 300 Theme Articles — on essential subjects such as Original Sin, The Thousand Year Reign of Christ, and The Sovereignty of God. Over 250 Visual Aids — maps, timelines, charts, illustrations, and diagrams of genealogies and chronologies for visual learners. Over 90 Person Profiles — articles on key Biblical figures. Over 140 Interior Maps — to show what’s going on where. Over 65 Timelines — show how key events connect with overall Biblical and secular history. Chain References — lists one hundred central Hebrew terms in the Old Testament, and one hundred central Greek terms in the New Testament. Other supplements — overviews, summaries, contextual information, literary outlines, a features guide, a section on how to study the Bible, and compelling quotations from each biblical book. * Please note: the daily reading plan is not available at this time. Upgrade Pricing Available! If you've previously purchased the New Living Translation - NLT, you can purchase this item for a special upgrade price. The upgrade price will be visible when you log in to your Olive Tree account and add the item to your cart (NOTE: Upgrade pricing is only available on www.olivetree.com, and not via in-app purchase).